Dr. Warren Chapin has a solid job conducting autopsies on executed prisoners. On the side, he’s a bit of a mad scientist, formulating theories about fear. He sees fear as a creature living inside every single person – a creature he calls “the tingler,” because it sends a tingling sensation up your spine. He theorizes that our ability to scream suppresses the creature and keeps us from dying of fright? But how do you test such a theory? On a deaf woman, of course. Dr. Chapin meets Ollie Higgins, whose wife Martha just so happens to fit the criteria – the perfect test subject for his theory. The film’s budget is estimated at $250,000. Judith Evelyn, who plays Dr. Chapin’s lab rat, was not actually deaf. William Castle had many ideas before deciding on the “Percepto” feature (of hidden buzzers in some of the theater’s seats). Some of the rejected tactics were leg tickling and small speakers that would give off a screeching sound when the tingler appeared on screen. The tingler’s appearance is based on that of the velvet worm. Pamela Lincoln and Darryl Hickman, who play lovers in the film, were married in real life from 1959 to 1982 and had two children. The film is parodied in 2007’s Trail of the Screaming Forehead (which I haven’t seen, but it looks kind of hilarious, so I might have to track down a copy soon). Vincent Price is so completely perfect. He wins me over in every film, but this role is what really solidified him as a favorite of mine. He definitely gives his character a creep factor, but at the same time gives him an air of levelheadedness: not an easy feat when you’re playing a mad doctor. 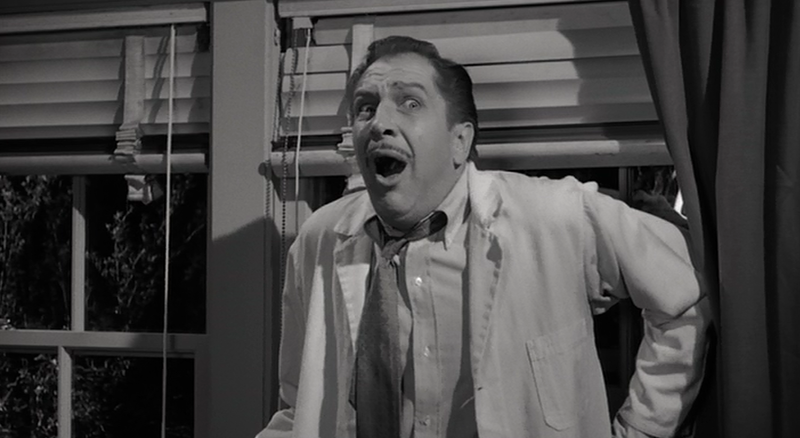 He’s one of the only actors that can rival the horror greats of Bela Lugosi, Peter Lorre and Boris Karloff. Silent film references, aw yeah! You’ve got to love that the film features scenes from 1921’s Tol’able David, and that the Higgins’ own/operate a silent film theater. Mr. Higgins refers to his wife as “deaf and dumb.” I know that the term was used at the time and it’s only because I’m a 21st century-dweller that I’m saying this, but it makes me hate him a little bit. Judith Evelyn was also perfectly cast. She pulls off her silent role with the perfect amount of exaggeration to suit the film’s mood. The dialogue between the characters of Dr. Chapin and Isabel is so friggin’ great. She reveals herself to be crazy – but so is he. The tension between them means big drama (and even a few laughs over the snide jabs that they take at each other). While widely regarded as a bit of a cheesefest, some of the scenes are legitimately creepy. The idea of a big ol’ bug crawling around in my back certainly gives me the heebie-jeebies! 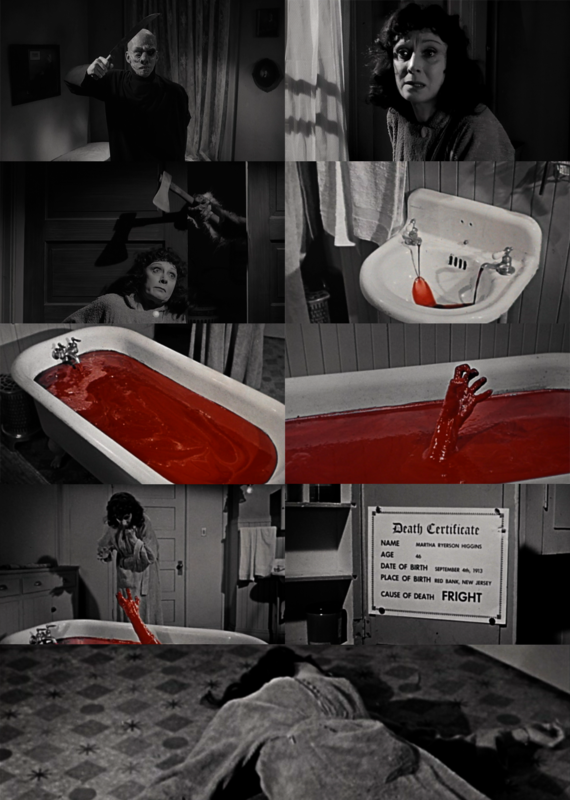 Mrs. Higgins’ acid trip is probably my favorite horror scene of all time. The brilliant mix of black and white with color along with Evelyn’s performance and the use of super awesome, “movie monster” creatures always leaves me a bit stunned. 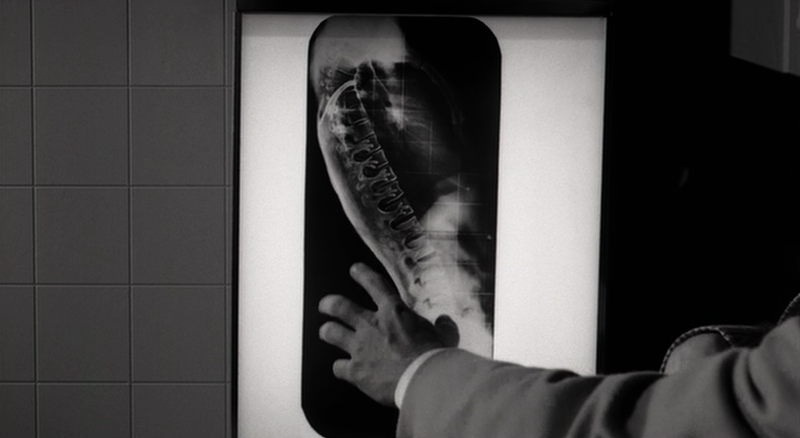 If the tingler is strong enough to kill a man, I’m pretty sure it’d be strong enough to break out of the dinky metal box that Dr. Chapin traps it in. I can only imagine how much fun it must have been to see this film in the theater with all of Castle’s effects. (MAKE IT HAPPEN, TCM!) The theater scene in particular is BRILLIANT. The film is obviously gimmicky, but so much fun to watch. I bought this DVD a few months back, but haven’t watched it yet…so I can’t check out this post until I do! But I’ll ‘like’ it anyway, because I know it’ll be good when I finally do read it (at which point I’ll comment for real!). It looks like fun! I’d read a blurb about it a while back, and found it cheap on Amazon (with some decent DVD extras), so I picked it up. I think I’ll watch it this weekend…I’ll let you know what I think. And Vincent Price did some good noir work, too…check out ‘Laura’ and ‘The Bribe’ if you haven’t already! I love ‘Laura’ but have yet to see ‘The Bribe.’ It’s on my never-ending list of films to watch, but top priority right now is making a dent in my Mill Creek sets and working on Stanwyck’s filmography, so I’m not sure when I’ll get to it. I love Price in any genre, though – even in his cameo in ‘Casanova’s Big Night’ – so I’m sure I’ll enjoy it! Thank you! :) The fun facts are my favorite part of making the Favorite Things posts (aside from rewatching the film, of course). I love digging up random stuff about the films. Love your post-pacted full of the trivia I love- Thanks for the great dialogue clips, too- classic cheese, but, oh, so good! It would be so fun to see it with all the original promotional tactics in place in the theatre! Thank you! I’m seriously considering starting a petition to TCM/Fathom… so many people have told me they’d also love to see it in the theater with the gimmicks, haha. Okay, I watched it this past weekend, and had a great time! Cheesy, but a surprisingly well-done cheesy, with a few truly creepy moments. Vincent Price was great, as was Darryl Hickman, and I loved the dialogue, especially the snide comments and comebacks by Price directed at his wife…great delivery! And how cool it would be to live in an apartment above a small, old-time movie theater! So glad to hear you enjoyed it! And I would definitely love to live in that apartment.